T. Janc, M. Luksic, V. Vlachy, B. Rigaud, A.-L. Rollet, J.-P. Korb, G. Meriguet and N. Malikova, Ion-specificity and surface water dynamics in protein solutions, Phys. Chem. Chem. Phys. 20 (2018), 30340. 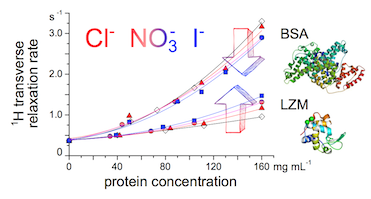 Abstract Ion-specific effects at the protein surface are investigated here in light of the changes they infer to surface water dynamics, as observed by 1H NMR relaxation (at 20 MHz). Two well-known proteins, hen egg-white lysozyme (LZM) and bovine serum albumin (BSA), show qualitatively opposite trends in the transverse relaxation rate, R2(1H), along a series of different monovalent salt anions in the solution. Presence of salt ions increases R2(1H) in the case of lysozyme and diminishes it in the case of BSA. The effect magnifies for larger and more polarizable ions. The same contrasting effect between the two proteins is observed for protein–solvent proton exchange. This hints at subtle effects ion-binding might have on the accessibility of water surface sites on the protein. We suggest that the combination of the density of surface charge residues and surface roughness, at the atomic scale, dictates the response to the presence of salt ions and is proper to each protein. Further, a dramatic increase in R2(1H) is found to correlate closely with the formation of protein aggregates. The same ordering of salts in their ability to aggregate lysozyme, as seen previously by cloud point measurements, is reproduced here by R2(1H). 1H NMR relaxation data is supplemented by 35Cl and 14N NMR relaxation for selected salt ions to probe the ion-binding itself.